Waiting ages in line for food while rocking out at a music festival is not what dreams are made of. While sometimes a sad reality, we’re here as your guide to know where to grab the best plant-based grub while swaying away to your favorite tunes at Coachella, Lollapalooza, Bonnaroo, and other jamborees. While some festivals offer great music, they can fall short when it comes to the food. Others are known for offering great cuisine, with some of the attendees even partially (or mostly) at the festivals to try out the amazing and unique eats. 1. Scope out the vegan options as early as possible when the food lineup comes out (if it does). You’d be surprised at how some of the vendors have incorporated choices for even the smallest niches of dietary needs. 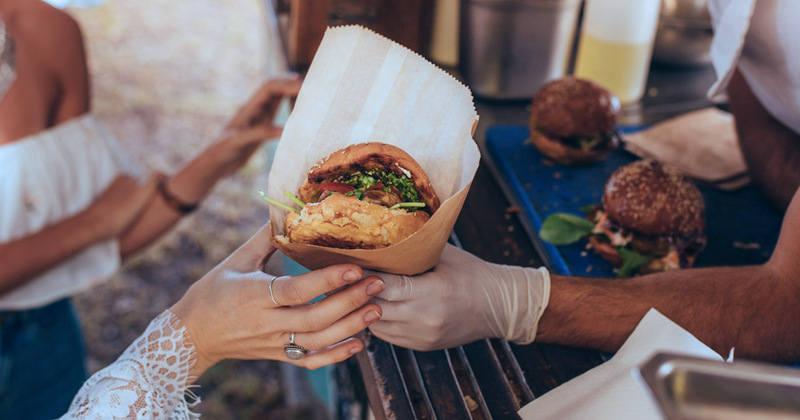 For music festivals with highlighted food truck lots/events, the organizers of the festival will almost always include a large variety of cuisines. 2. If there is no food lineup published, or limited information about the specific food vendors at the festival, consult with previous attendees or friends. I have found reddit and other forums on music festivals are incredibly helpful for preparation, too. 3. If you get to the festival, and there aren’t any food vendors offering explicitly vegan options, you can always ask food vendors if they are able to modify something for you to meet your dietary needs — like leaving the cheese out of a veggie burrito, or removing the egg from an otherwise plant-based ramen bowl. 4. If it really appears that vendors won’t have options on site, you can always check the festival rules and regulations for their policy on bringing outside food in. If you choose this route, remember that preparation is key — fresh or cooked food that doesn’t keep well in hot or damp climates is probably not the best thing to pack. Think camping foods: granola bars, sandwiches, nuts and seeds, plant-based protein snacks like popcorn or pretzels, and other non-perishables. Citrus, pome or stone fruits like apples, nectarines, or clementines are a great easy-to-eat snack or refresher to pack, since they are hydrating and restorative to blood-sugar levels. They also have great energy-boosting qualities. More info about Coachella eats here. More info about Lollapalooza eats here. Ready for more? Follow OMD on Facebook, Twitter and Instagram for a daily dose of plant-based inspo! Maggie Taylor is OMD’s Campaign Assistant. Originally from Wichita, KS, she’s a foodie-on-a-student-budget who loves to explore the newest plant-based restaurants, getting lost in YouTube cooking videos and hunting for finds at flea markets.